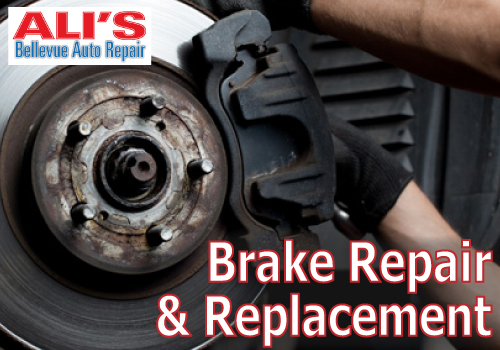 Our Bellevue shop handles brake repair or replacement for any make and model. Come get your brakes checked for FREE today! You won't find a more prepared shop to handle any brake repair Bellevue WA folks need. Whether it's a routine pad replacement or repair of a brake issue with areas such as the rotors or calipers, we can take care of it right here. Some say that brake pads can last as long as 50,000 miles, but depending on usage and type of vehicle, they can last as little as 10,000 miles (it's rare but possible). Replacing the pads BEFORE they wear down is the key to making your vehicle's brake system last without costly repairs. When you come in for any of your other servicing, oil changes, or repairs, we will go ahead and report back to you on the current wear and tear. We always give you an honest report---you can trust that we actually want you to get as much life as possible out of your brake pads. Over time, though, other brake repairs may become necessary. No matter what your brake system needs, we are ready to handle it completely. We have been doing Brake Repair Bellevue WA drivers can count on for years, and it will show! If drums, discs, or rotors are worn or even damaged, we can take care of it for you. We'll inspect and check on your brake fluid and your hydraulic system. Any service offered by the national chains can be taken care of right here at Ali's Bellevue Auto Repair. 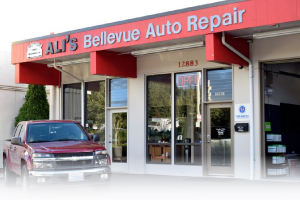 If you hear squealing or screeching of any kind if it has been more than a year or over 20,000 miles since your last brake check, get your car to Ali's for Brake Repair Bellevue WA trusts and depends on!